I cannot believe it, but it’s less than a week (eek!) until Easy Gourmet is released. I’m excited and nervous and all the crazy feelings. I’m one of those emotional eaters, so in order to calm myself, I’ve been doing what I do best and made myself delicious things to eat. As it is, I’m kind of addicted to puff pastry, but when in an emotional state, I’ve been known to eat puff pastry baked up, plain. 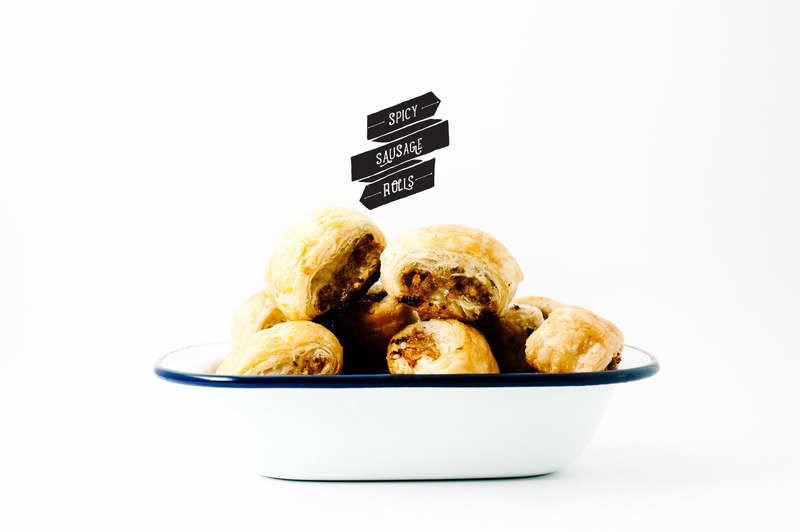 Of course, that isn’t much of a recipe, so here I stuffed it with some spicy sausage to make of of my all time favourite snacks: sausage rolls. 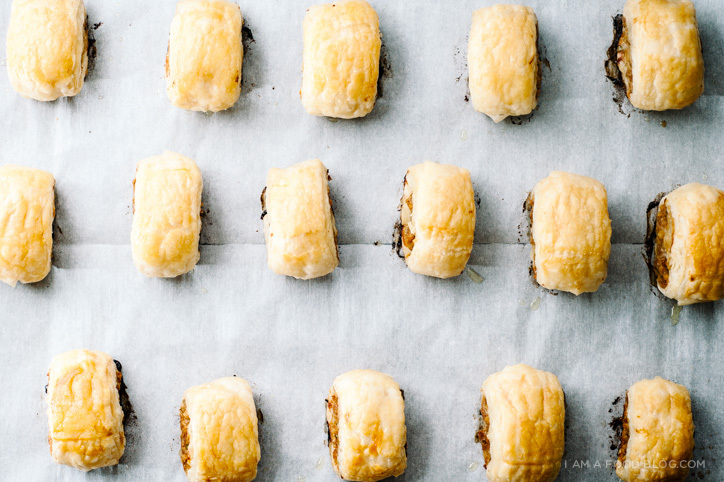 I’ve confessed my love for sausage rolls in the past and I’m still not over them. If anything I’m even more obsessed. Last year, while visiting Australia, I noticed they were everywhere: in coffee shops, at the corner stores, and in bakeries. I had a particularly delicious pork and fennel sausage roll at Bourke Street Bakery. Sausage rolls aren’t as popular in North American and I’m not too sure why. Juicy meat tucked into a buttery, flaky blanket sounds just like my idea of heaven! In a small frying pan, heat up the oil over medium heat. Add the shallots and cook, stirring occasionally until soft, about 5-7 minutes. Stir in the spicy Korean seasoning or red pepper flakes. Remove shallots from the pan and set aside to cool. Crack the egg in a small dish and gently whisk. In a mixing bowl, combine the ground pork, green onions, breadcrumbs, salt, pepper, and the cooled spicy shallots. Add half the lightly beaten egg. Reserve the other half of the egg for an egg wash. Gently combine until throughly mixed. 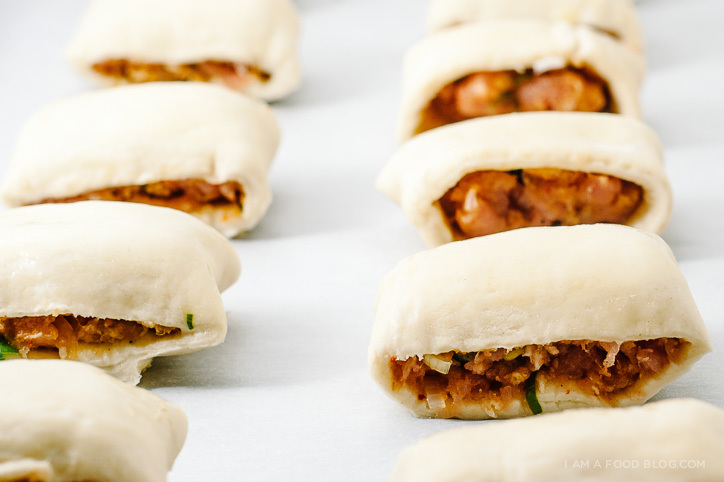 Divide the pork in two and arrange in a line on the puff pastry. Fold the top half of the sheet down over the meat. Brush the bottom part of the sheet with the egg wash and roll the puff pastry and meat so that the seam is facing down. Repeat with the other sheet. Cut each roll in 8 even pieces. Arrange on a parchment paper lined baking sheet and bake until golden brown and puff, about 35 minutes. Let cool and enjoy warm or cold. 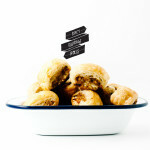 Ohmagawd I freakin’ love sausage rolls. Can’t wait to try this recipe. ALSO AHHHH SO EXCITED ABOUT YOUR COOKBOOK! So exciting, lady, eeep! 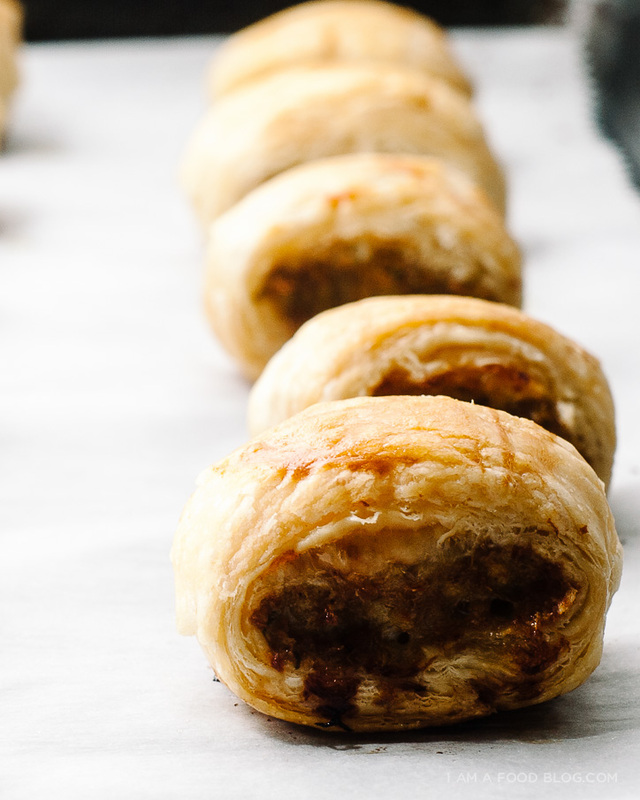 I can’t believe I’ve never had a sausage roll before because juicy meat in a buttery, flaky pastry sounds like just about the best thing ever. Yum! I love sausage rolls. I ate tons of them when I went to London a few years back. I don’t know why they aren’t that popular in the US. So I guess I’ll have to make my own. Thanks for the recipe. And yipee for the book!!! Omg omg these look SO good. 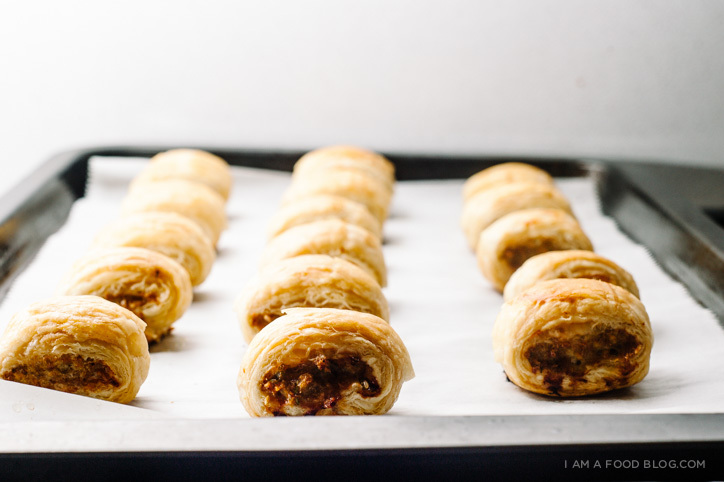 I could totally eat puff pastry plain too, but these — I want to eat nothing BUT these. With the Korean seasoning, too? I love you. Oo yum! I haven’t heard of these but already plan on making them as soon as possible. They look so delicious. I’m kinda addicted to puff pastry too, so these look so incredibly good. What an exciting time for you, can’t wait to see the book! Woo! Yay for the sausage roll! As a Full blooded Aussie you have done this classic justice with this recipe. They have also added a a few new ones since then, I think one (limited edition) which has ground bacon is particularly good . Congrats on the cookbook! Excited to see some new recipes! Love the idea of korean seasoning in it! Yum! Also, OMG CANNOT WAIT FOR EASY GOURMET!!!! Preordered your cookbook weeks ago’ so excited to receive it!! just pre-ordered! I’m having a thing for puff pastry lately. People love pigs in a blanket…even though I grimace even comparing the two. Puff pastry; swoon! Yum Yum and double yum on top of that! Love your work you’re such an inspiration! This is the first time I am seeing your blog. Very wonderful graphics. Those are easier to appreciate on first glance than recipes. I am a small caterer with a design background. The way you were carrying on about puffed pastry, I was really relieved that you didn’t want me to make it from scratch. looking forward to trying some of you recipes. Do you think shichimi togarashi would be a suitable substitute for the Korean seasoning?